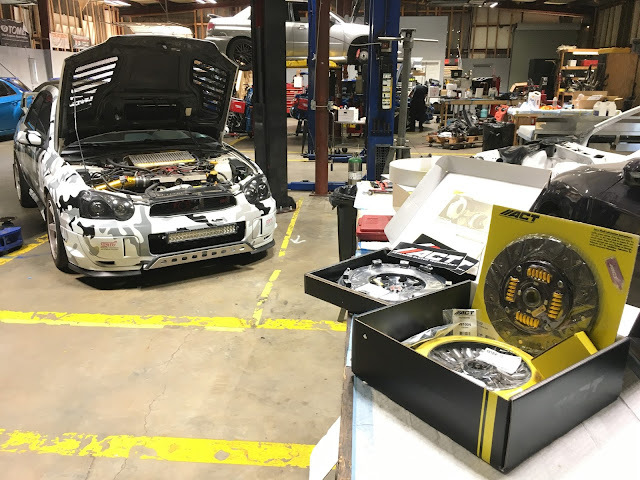 Circuit Motorsports: Flat-Out: When to Replace Your Clutch? When to Replace Your Clutch? A big question that we often get is: When should I replace my clutch? The obvious answer to that would be...when it starts to slip! Once it slips, there's no coming back and it needs to be replaced before it becomes an issue. However, the not so obvious answer would be - How many miles are on your current clutch, and what are you future plans? 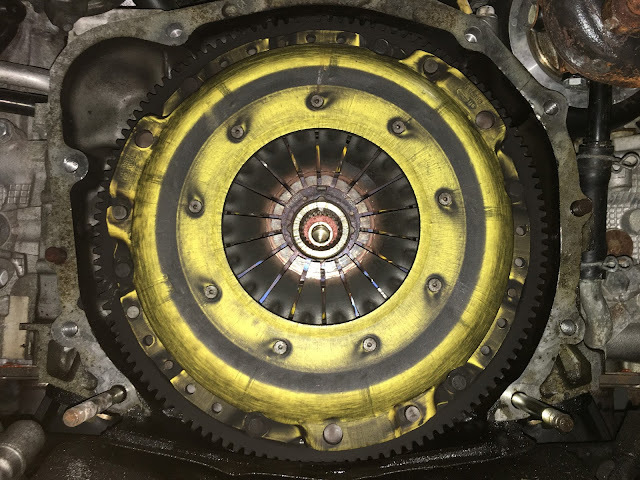 Read on to see when it may be a good idea to replace your clutch before it slips! 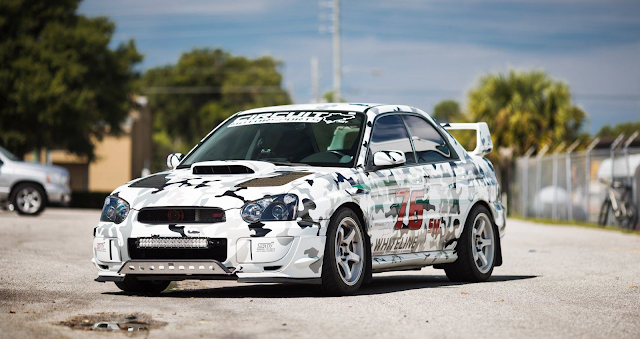 The Circuit Motorsports STi has been a staple around the shop for a long time. With it's Urban Camo vinyl scheme it is instantly recognizable around the area and has been a test bed for new parts and ideas over its tenure. Recently it has been on the back burner while we worked on other projects, but the time has come for owner Tristan to get it back into shape. He plans on taking it on a week long trip to the mountains for some true driving zen, and it needs to be in fighting trim to do so. This is where the clutch replacement question comes in: The car has been running an Advanced Clutch Technologies (ACT) HD clutch kit for about 45,000 miles without issue. Currently the clutch still feels very strong, but the pedal has been catching high on the travel stroke recently, and this is usually an indication of the clutch disc wearing thin. So with an upcoming 2,000+ mile trip in a month, with hard up-hill driving, and the need for the car to make it up and back under it's own power, it was decided to preemptively replace the clutch before any slipping occurred. The same can be said if planning to compete in an upcoming track day or autocross, rallycross etc. If you know your clutch has a lot of miles on it, and it NEEDS to work for some type of event or trip, it's best to plan ahead and ask yourself - "IF it slips during XYZ, will it be a crisis or no big deal"? As a side-note, another reason for replacing a clutch preemptively is if there is an item that needs to be addressed in the area of the clutch. 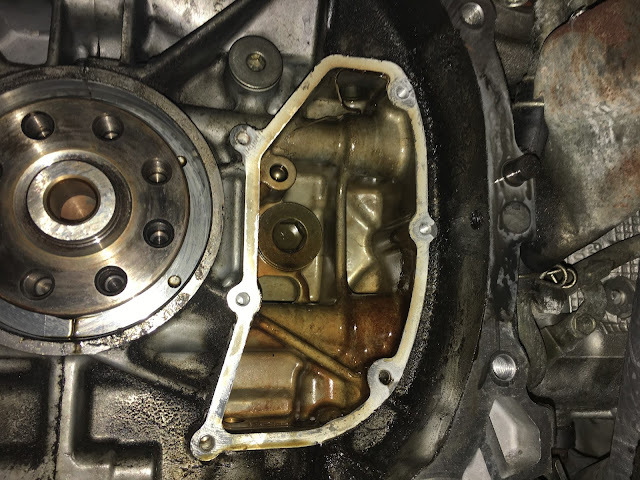 The CMS STi has been leaking oil from what was assumed to be the rear main seal, which is located on the back of the engine. To get to this seal either the engine needs to be removed, or transmission has to come out. So we figured we would kill two birds with one stone, and address the leaking seal and clutch at the same time. When doing such a large repair it is always pertinent to take care of wear items that would be equally hard to reach on their own. This saves you labor time and money in the long run. 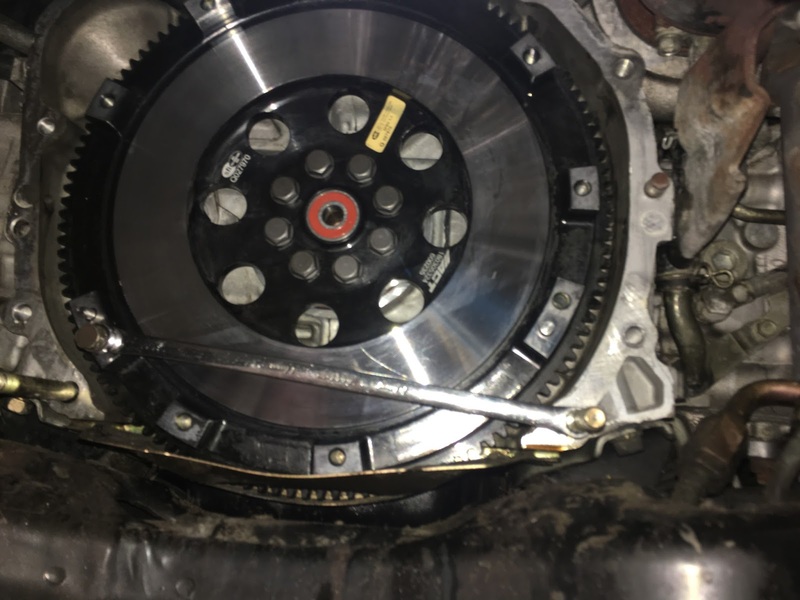 So let's say you pull a transmission for a leaking seal, even if your clutch has a little bit of life left in it, it would be best to replace it now, rather than to pull the transmission again shortly down the road just for the clutch. Time is money, as they say. The next decision was: What clutch do we replace the current unit with? 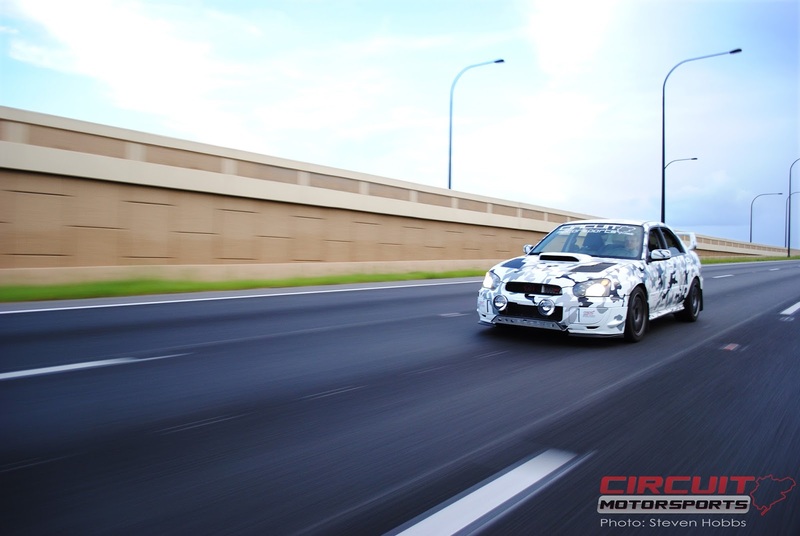 It's generally a good idea to spec a clutch for the type of driving you do, and the power you make now. The caveat to that would be if you plan on making significantly more power in the next 6-12 months, then planning for that power level/type of driving needs to be factored in. However, we don't recommend the thought process of - "Well at some point in the next year I may do one track day". Don't sacrifice 364 days of driving for 1 day of possibly being out on a track. Do your research, narrow clutches down by disc type and the power they will hold, and read reviews. 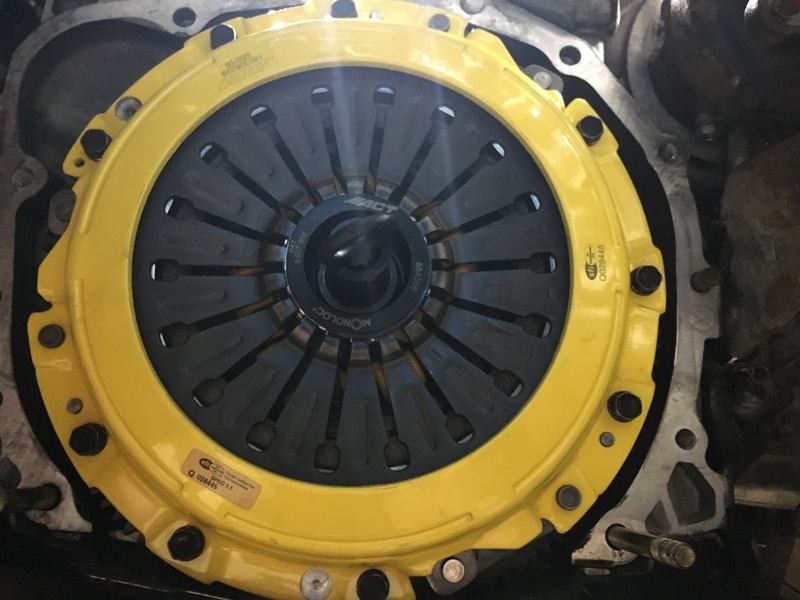 Generally a full face disc will be easier to drive on the street, but something like a 6 puck clutch will offer more holding power, while sacrificing some comfort. You also don't want to *over* spec a clutch. If you're making 250hp to the wheels, you don't need a clutch that will hold 600. A school of thought on too much clutch grip is that the clutch won't break but other things will, such as a transmission or axle. There are a lot of brands and flavor of clutch, so choose wisely! 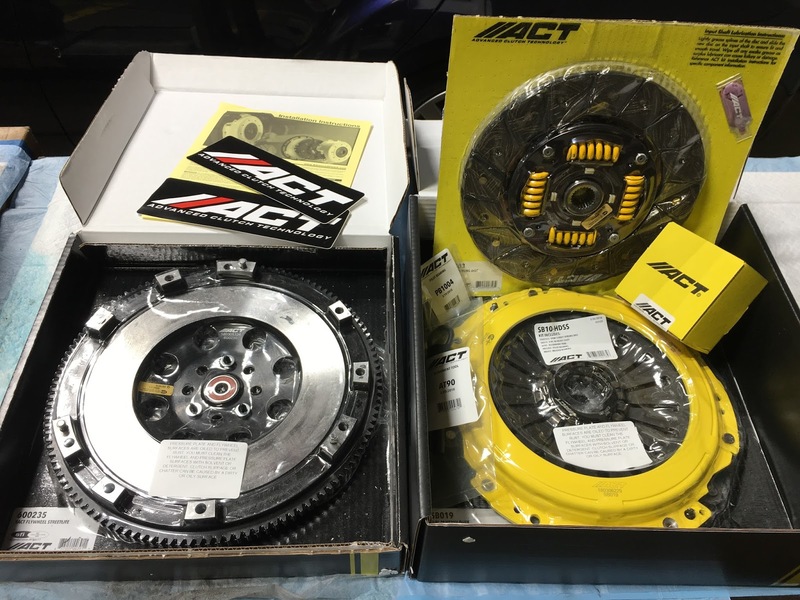 Tristan chose to go with the same exact clutch kit and flywheel, an ACT HD street disc and pressure plate, new bearings, and a Streetlite flywheel. The previous ACT kit had served him well, never slipping, and being very easy to drive on the street. Since the car was not going to be going through any significant power changes, this was an obvious choice for him. He also decided to go with a new flywheel, as it is recommended to either use a brand new flywheel with a new clutch kit, or at the very least resurface the old one. 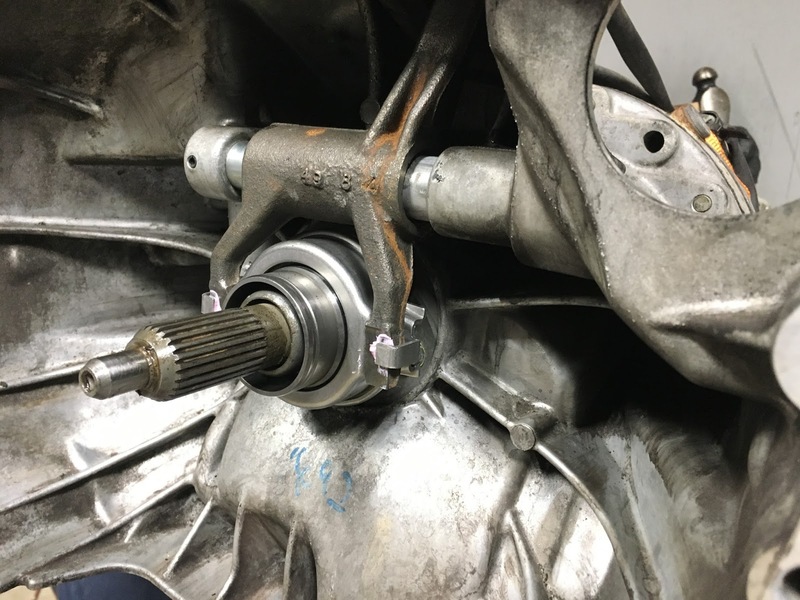 A lightened flywheel reduces the mass that the engine crank needs to move, thus increasing the speed with which the engine can rev...and uhh...we like to rev. So the Streetlite flywheel is a perfect balance of shedding weight over an OEM flywheel, while not being too light, which can become difficult to drive on the street and in stop and go traffic. The old clutch and flywheel out, not too bad! The first step was to get the 6 speed transmission out of the STI and get the old clutch kit out. 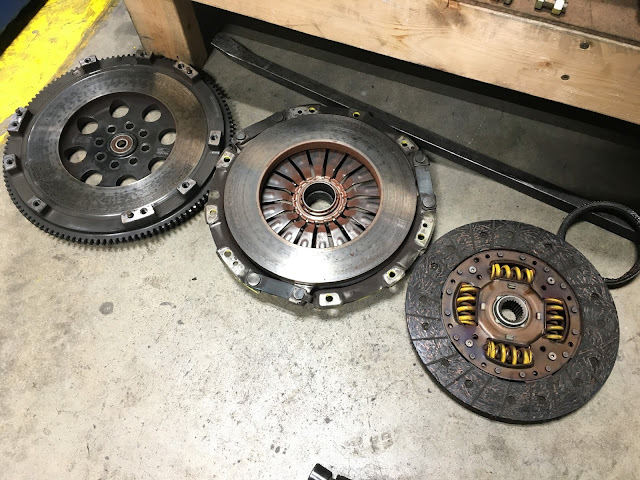 With the transmission out and the clutch removed, it was a surprise to see that the clutch disc was actually in very good shape, with a decent amount of material left. It had seen around 45,000 miles of hard use, and Tristan had expected the disc to be thin and at the end of it's service life. In truth, this clutch kit would probably have lasted another 10-20k miles or more. BUT, the oil leak had to be addressed as well, the culprit there turned out to be a leaking access plate on the back of the engine block, and not the rear main seal as first though. The oil leak not only served as an annoyance, but leaking oil into the clutch can cause very bad things to happen. So it needed to be fixed! The access plate removed to be re-sealed, you can see the oil residue that had been leaking out all around it. With the access pleat cleaned, and re-sealed, it was time for the new clutch kit to go in. The rear main seal was replaced even though it showed no signs of leaking, again, take care of any wear items you can in hard to reach places! Then the ACT Streetlite flywheel was installed, with a new Pilot bearing, and new flywheel bolts, torqued to spec. On top of that went the new ACT disc and pressure plate, again with bolts torqued to spec. A new throwout bearing included in the ACT kit topped it off. The Transmission bell-housing was cleaned, the input shaft and clutch fork pivot greased, and the transmission was installed back into the vehicle. Lastly, a new stainless clutch line was installed with fresh fluid. The car is now ready for another 50k of hard clutch abuse! Always clean and grease the input shaft and fork! New flywheel and clutch installed. One last note, is to always break-in a new clutch and flywheel. Most manufacturers will have their own clutch break-in recommendations, but the general rule of thumb is about 500 miles of easy driving. No full throttle applications or launches, stay under 4k RPM, and vary engine speed as much as possible (no highway driving at one RPM for long periods). Basically, drive your car like your Grandma would. Once the break-in period is over gradually ramping up the RPM and throttle is a good idea, then it's ready for action!